Put simply, moonshine alcohol is the commonly used term for a type of distilled spirit that was high-proof in alcohol. Since moonshine drinks first made an appearance in America, there have been a number of moonshine recipes recorded. Although it has been illegal to make it or sell it right up until 2010 in the US, over the past decade it has become legal and is now sold commercially in various countries. How did moonshine get its name? 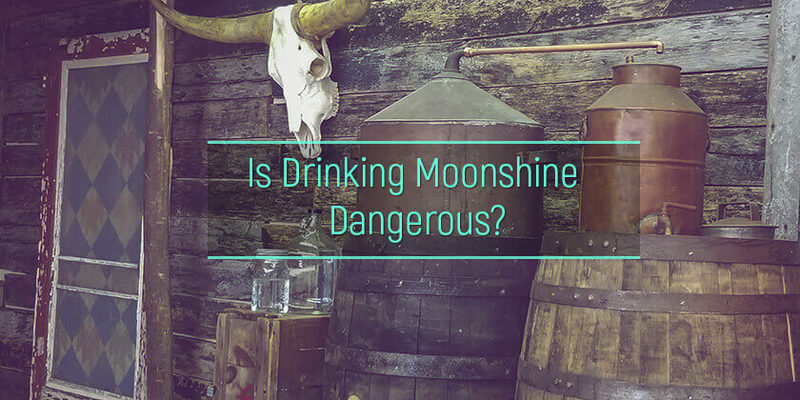 Why can moonshine be dangerous? How to tell if moonshine is safe? The current definition of moonshine is: “Clear, unaged whiskey” which is in line with the first types that were ever made. In order to further understand what exactly what it is, it is best to look at how to make moonshine. This type of drink is not to be seen as an alcohol substitute as it contains high levels of alcohol. Making moonshine is considered by some to be an art form. 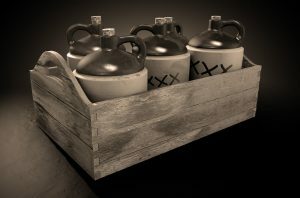 The pioneers of moonshine making utilized specialized equipment to construct their moonshine still, and each person would have their own unique set up and moonshine recipe. Over the years though, the various types that are made at home have come to share a fair few elements. Mostly it is made using a technique that is similar to how whiskey is made. But what is firewater made from? Well, the production process for creating it uses water and sugar with some grains (usually corn mash) which then goes through a distillation process. Once the alcohol is made, instead of aging it in oak barrels like most whiskey, the moonshine for sale is clear. The term ‘moonshine’ is believed to have come from several different places. ‘Moonshiners’ was a term applying to anyone who did their job by the light of the moon, and when it first appeared, it was distilled at night due to it being illegal at the time. There are also those who believe that the term comes from the word ‘moonrakers’ which was a name given to the early smugglers from England and the distillers who made and sold whiskey in the Appalachian Mountains. The term ‘moonshine’ was made more famous during the prohibition era of America when the liquor was made and sold illegally across the country. So is moonshine illegal? Well, while it was for a long time, it is now legally sold in a number of countries. As with all other types of alcohol, there are a number of dangers attached to the use of moonshine. Due to the processes required to create firewater, there can sometimes be unwanted by-products that are allowed into the final liquor. One such by-product is methanol. Methanol is believed to be added to moonshine by un-caring distillers to boost the apparent moonshine alcohol content. The intake of too much methanol can result in methanol toxicity. There are also some other dangers as well. In some cases on record, the finished liquor has been tainted by the use of cheap materials in the creation of the still. Some stills have been known to use the radiators from cars or trucks which can produce glycol from the antifreeze. They might also contain lead which has led to several cases of lead-poisoning or indeed the famed ‘blindness’ that is so often attached to this type of alcohol. When this type of high proof liquor is made using a still that has an automotive radiator as one of its components, there is a chance that lead used in the connections to the plumbing may result in lead poisoning, a side-effect of which is blindness. But because this liquor is now sold commercially, there is almost no chance of going blind from drinking it if it has undergone tests already. This is good news for those wanting to know how to help someone with alcoholism. Homemade moonshine, however, is not like the alcohol in mouthwash, there can be much higher levels of both alcohol and methanol in untested batches. There are luckily several ways to tell if firewater is safe for those with a loved one addicted to alcohol. One simple test that can be conducted at home is to shake a small clear container of the liquor. If the bubble lats a short while and are large, then the alcohol is higher than if the bubbles are smaller and last for a longer time. An older test would set a spoon full of the liquor on fire, and if it burnt blue than it was fine, yellow meant that it was contaminated and red meant that there was a lead in it. The answer to the question “how to drink moonshine?”is: safely and responsibly. Does moonshine go bad? If it is properly made, then it should only age and not go bad, but if there are impurities in it, then it can go bad. The extensive use of firewater is the sign a person needs help to treat alcohol dependence. For those who might be divorcing an alcoholic husband or wife, it would be advised to learn some more about this and other types of alcohol. The best way to cope with moonshine addiction is to contact the rehab clinic for alcoholics and find the professional help.